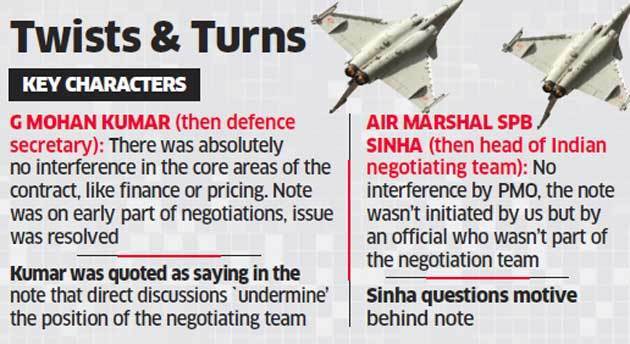 New Delhi: Amid a fresh controversy over the Rafale deal, Air Marshal SBP Sinha (Retd), who was leading the Indian negotiating team for the fighter jet purchase, on Friday rejected the charge that the Prime Minister's Office (PMO) had held parallel negotiations. Former Defence Secretary G Mohan Kumar also said it was "absolutely wrong" to say that the PMO was conducting a parallel negotiation, as alleged in a media report citing internal Defence Ministry file notes to which the Congress and other opposition leaders have latched on to attack the Modi government over the Rafale deal. Defending the deal, Kumar said it was negotiated in the "most transparent way". "There was no parallel negotiation and every word in the Intergovernmental Agreement is jointly decided by the Indian and the French negotiating teams without participation of any other agency," Sinha told PTI. Sinha, who was one of the top Air Force officials leading the Indian negotiating team, the official who initiated the file noting was not part of the negotiating team and questioned his "locus standi" and motive for doing so. A major political controversy has erupted after The Hindu newspaper reported that the Defence Ministry had raised strong objections to "parallel discussions" conducted by the PMO during negotiations for the Rs 59,000-crore fighter jet deal between India and France. The report, citing ministry file notes, was used by Congress president Rahul Gandhi and several other opposition leaders to raise questions on the role of Prime Minister Narendra Modi. Kumar, who was the defence secretary when the deal was signed, said the matter (raised in the note) refers to sovereign guarantee and not the price. There were several unsettled issues that were being sorted out and the sovereign guarantee was one of it, he said. France has given a 'Letter of Comfort' to India for the Rafale deal. "It is unclear at whose behest this note was written," he said. "None of us was aware of the note and neither was it discussed with the Indian negotiating team," Sinha said.